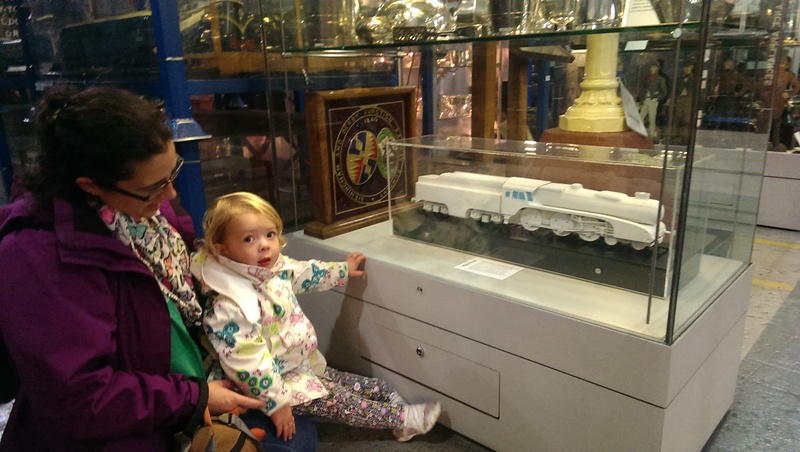 After attending the AST conference in Haworth on 9th October, William Powell travelled with his family to York where they visited the National Railway Museum. William was surprised (and pleased) to discover his model of the 5AT on display in the “Warehouse” section of the museum. William built the 1 : 30 scale model in 2007 as his final year project at Bournemouth Arts Institute (see 5AT website) and loaned it to the 5AT Project for use as a visual display to accompany presentations that the group made from time to time. Since the suspension of the 5AT Project in 2012, the model passed into the hands of the AST group. With William’s (retrospective) permission, AST donated the model, together with copies of the 5AT Fundamental Design Calculations and Feasibility Study, to the NRM in January 2016 (as reported in the Feb 2016 newsletter). William, who joined the ASTT in 2016, is now a builder of miniature live-steam models. It may be hoped (and the suggestion has been lodged) that one of these days he builds a live steam model of the 5AT!